Linda LeMura, Ph.D., fondly remembers her days as a student at Bishop Grimes High School, where she not only achieved in the classroom but also on the basketball court, in the folk group, and in student government. Looking back, she appreciates the sacrifices her parents made to send her—and her five siblings—to the former Our Lady of Pompei School and Bishop Grimes. 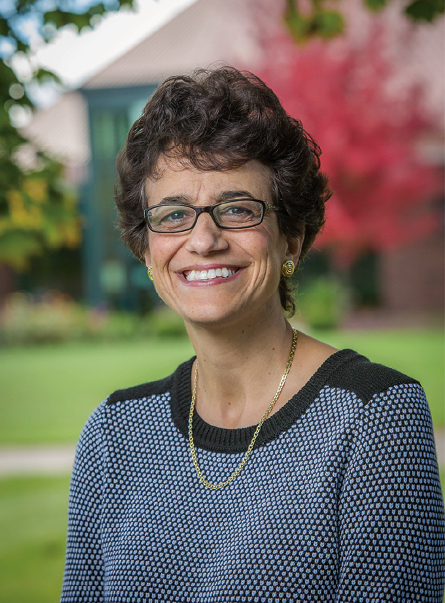 Today, she continues to draw on the faith and values of her Catholic education, not only as Le Moyne College’s newly-elected president but also as the first laywoman president of any Jesuit college in the world. With roots in the Syracuse Diocese and a philosophy built around the Jesuit tradition of educating the whole person, LeMura is committed to furthering Catholic education not only on the Le Moyne campus but through a “K-16 pipeline” that will help to ensure the passage of faith and knowledge from the start of kindergarten to the day of college graduation. It is a philosophy she sees as beneficial to the more than 5,000 students in Catholic elementary and secondary schools in the diocese, as well as nearly 4,000 students currently studying at Le Moyne College. LeMura cites Pope Francis as a particular source of inspiration for collaboration, as the Jesuit pontiff has been vocal about the need to support Catholic education. Le Moyne already has a long history of sharing its resources with diocesan Catholic schools, including the Loyola Scholars Program, where Catholic high school students take college-level courses in the summer for a reduced rate; the Le Moyne-Diocesan Graduate Program, where the college contributes to the cost of tuition for Catholic school faculty completing advanced degrees at Le Moyne; and an initiative at Cathedral Academy at Pompei, where student-teachers from Le Moyne gain experience in the classroom and provide much needed resources to the school that serves a primarily immigrant population. These are just a few examples, however, and LeMura has no shortage of other ideas she hopes will continue to keep Catholic elementary and secondary schools’ enrollment strong while drawing students to higher education at Le Moyne College. Le Moyne College has to offer,” LeMura said. To this end, Le Moyne continues to offer an expanded curriculum, more study abroad opportunities, and a variety of dual degree programs where students begin their college years at Le Moyne but can later transfer to complete advanced degrees at places like Fordham University College of Law, Syracuse University’s College of Law, Maxwell School of Citizenship and the LC Smith College of Engineering; and the Cornell University College of Hotel Administration. LeMura is currently exploring other collaborative options with Georgetown University and Boston College. There’s no denying that this former Bishop Grimes student has certainly made the most of her Catholic education, and she is just getting started with a level of commitment that is certain to benefit students seeking a Catholic education at every level in the Diocese of Syracuse. Caroline K. Reff is a freelance writer and the marketing consultant for the Catholic Schools Office.